Will Robots Replace Tellers In Bank Branches? Banks around the world are rolling out robots in their branches. 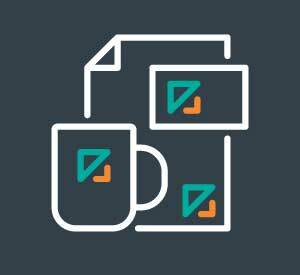 Are they little more than promotional gimmicks? 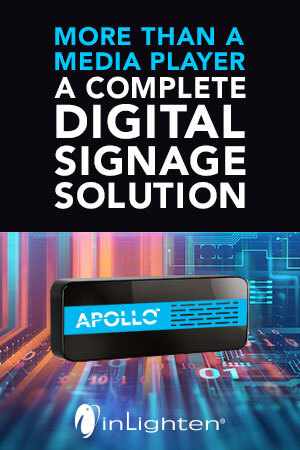 Or will these electronic greeters undermine the personal touch branch users crave? Emirates NBD has announced that a new artificial intelligence robot will be strolling into the foyer of several branches. 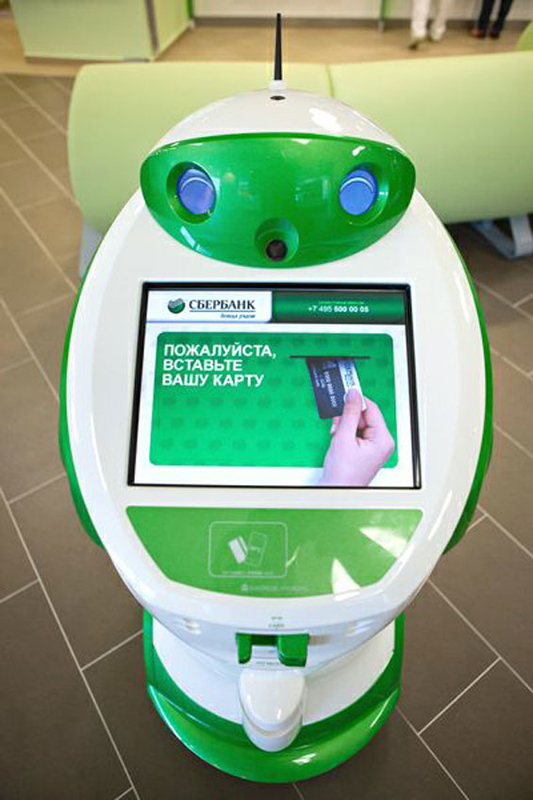 The robot will interact with customers and assist the bank’s staff when presenting products and services. The bank also plans on leveraging the robot for marketing purposes and promotional appearance. Emirates NBD, based in the UAE, is the latest to introduce artificial intelligence robots that are intended to engage consumers in branch enviroments. There are now about a dozen retail financial institutions around the world that have integrated robots into their branch experience, including banks in Brazil, India, Russia, Japan and Taiwan. Santander may have been the first financial institution anywhere in the world to deploy robots back in 2010. The little red robots used GPS technology to guide visitors around the bank’s headquarters campus. Santander’s knee-high robots are a little shorter than R2D2, but like the stumpy Star Wars droid, they are fluent in multiple languages. 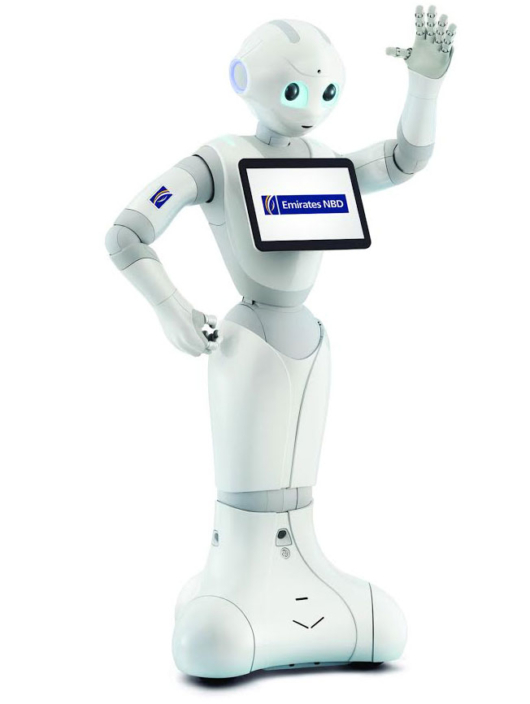 The model that Emirates NBD chose is dubbed “Pepper.” Developed by French company Aldebaran Robotics, which is a subsidiary of Japanese telecom and internet firm SoftBank, Pepper is reportedly the first humanoid robot with an “emotion engine” capable of recognizing principal human emotions and adapting its behavior to the mood of those with whom it interacts. Softbank says Pepper is capable of interpreting a smile, a frown, your tone of voice, as well as the lexical field you use and non-verbal language such as the angle of your head, for example. Pepper measures four feet tall and weighs about 60 pounds. It incorporates a 10.1-inch touchscreen display, and runs for about 12 hours on a lithium-ion battery. There are four microphones in its head, two RGB cameras, three touch sensors and a “3D sensor.” There are also touch sensors in its hands, and an additional gyro sensor in its chest to help it maintain balance. The robot can move around at a speed of about two miles per hour, and climb six inch stairs. Mizuho Financial Group, a bank based in Japan, was actually the first to deploy Softbank’s Pepper robot in a branch. 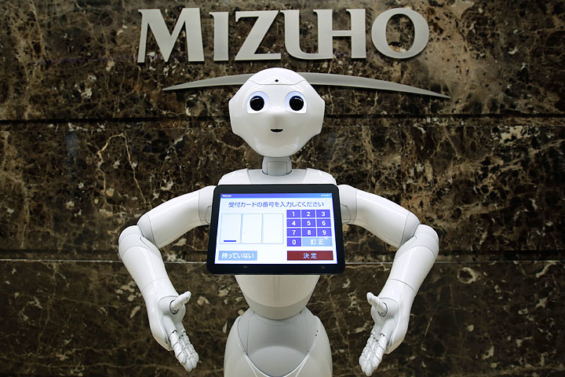 “Pepper gets people excited about going to the bank,” says Tetsuhiko Saito, head of personal banking at Mizuho’s main lending unit. Mizuho Bank says Pepper will be used to entertain customers with games and multimedia, and provide basic information on products. They are apparently planning to add this robot employee to five other branches in Tokyo. 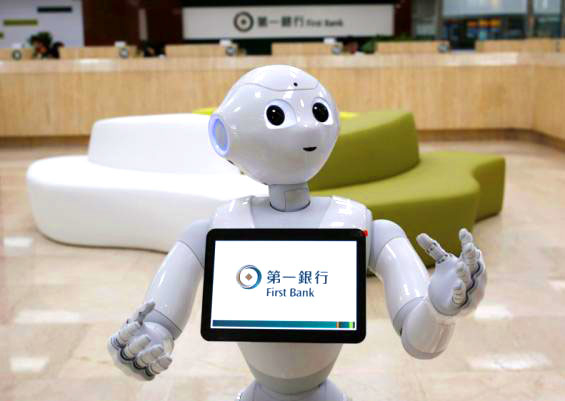 First Bank in Taiwan is also leasing Pepper robots for its branches. The two-year contracts are running them $836.67 per robot per month. If you want to buy a Pepper robot, the price tag hovers around $2,000. But when factoring in fees for insurance and apps, the total cost in the first three years reportedly rises to more than $11,000. 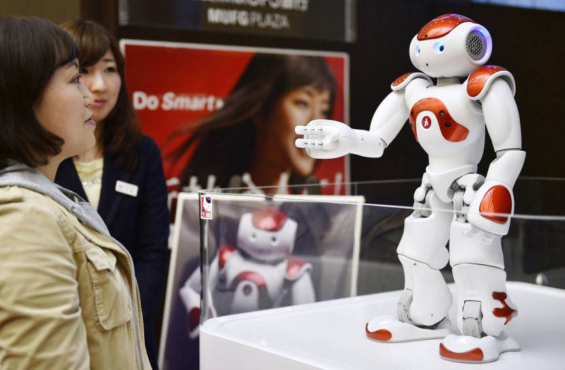 Mitsubishi UFJ has is another bank that has rolled out robot greeters. They chose a different model called “Nao,” also developed by Aldebaran/SoftBank. 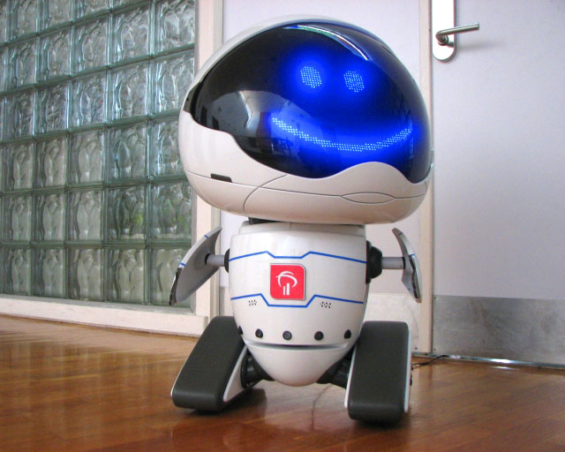 Nao is much smaller than Pepper — just 23 inches tall, weighing around nine pounds — and is much more expensive, costing approximately $8,000. But Nao can remember details from more than 5.5 million customers and over 100 different products. Nao is designed to respond in 19 languages, and can talk about a wide range of banking topics, current events, weather and even provide directions. Nao’s microphones detect where sounds are coming from, allowing it to move closer to the speaker and point its head in the right direction — just like a normal human being might. 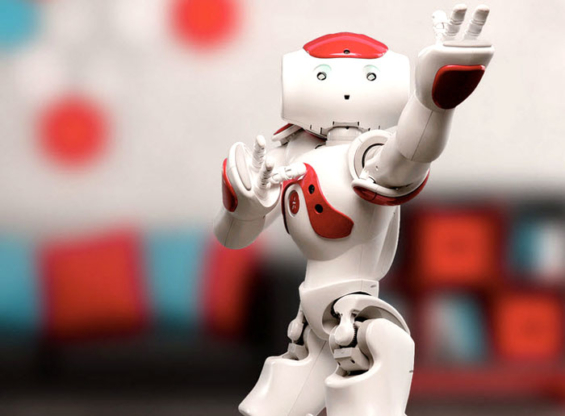 Nao can then analyze voice patterns, facial expressions and interpret emotions. Nao uses a combination of cameras and voice recognition to identify people, so it can greet people as soon as they walk through the door. 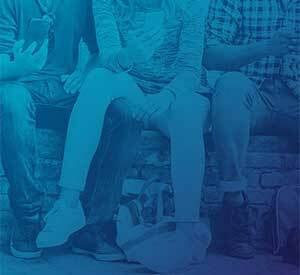 Using a customer relationship management application built on a cloud-based artificial intelligence engine, Nao is able to wish a customer “happy birthday,” or recognize when a missing field in their profile needs to be updated. 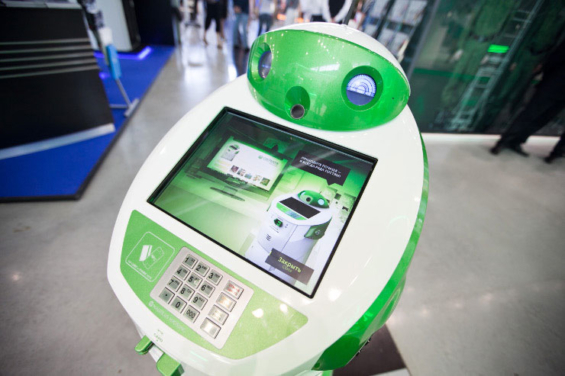 Sberbank in Russia has deployed a robot named Sberbasha, which loosely translates to “Your Savings Robot.” This robot, built by Nautilus Hyosung in Korea, is more than just an 8-bit receptionist. The mobile ATM and POS terminal can actually handle non-cash transactions. It reacts to both movement and speech, and responds with a pleasant female voice in multiple languages. 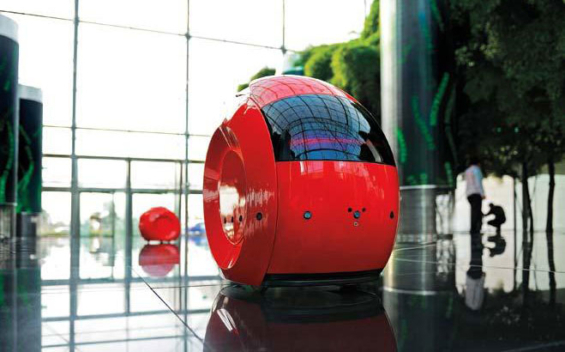 This robot greeter, nicknamed Link 237 was developed by IDMind for Banco Bradesco in Brazil. While robotic gadgetry may be a fun toy to play with, but you have to wonder: Should banks be dragging consumers back into their branches? Aren’t retail financial institutions supposed to be driving consumers to self-service and digital channels that are less expensive to maintain? For argument’s sake, let’s assume that branches still play a role in building relationships with consumers. If customers are coming to branches to get that “human touch,” does it make sense to have an artificial being greeting them at the door? And are the robots available today — even those with “emotion engines” — really capable of creating and cultivating relationships with people? Consumers are often frustrated by technology, and already feel that banks treat them like “a number.” Think about it: automated voice response systems and complex phone trees are maddening. 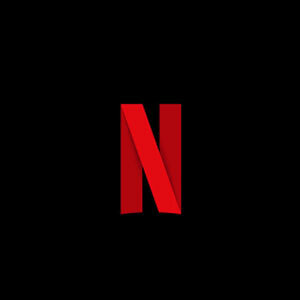 The problems customers encounter in these other digital — and less personal — channels are probably a big reason that they drove to the branch in the first place. You could argue that the last thing a customer irritated by tech issues wants to see is more tech. How many times does someone have to hear a robot respond with, “I’m sorry, I didn’t understand you. Would you repeat the question?” before they want to rip the robot’s electronic eyes out? This article was originally published on October 25, 2016 . All content © 2019 by The Financial Brand and may not be reproduced by any means without permission.